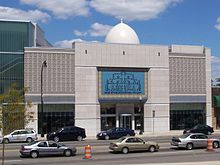 The Arab American National Museum (AANM, Arabic: المتحف العربي الأمريكي‎) opened in 2005 and is the first museum in the world devoted to Arab American history and culture. Located in Dearborn, Michigan, the Museum seeks show visitors the Arab American story through a timeline of exhibits while dispelling misconceptions about Arab Americans. The museum features three permanent exhibits. The first floor features the contributions of the Arab civilization such as science, medicine, mathematics, architecture, and the decorative arts. The second floor focuses on the Arab experience in America, including a gallery about prominent Arab-Americans such as Ralph Nader and Helen Thomas. Documents and artifacts from Arab Americans related to immigration and the immigration process are displayed, and stories of Arab Americans are portrayed in video or audio recordings. The AANM also includes two large gallery spaces for the exhibiting of art. The Museum's inaugural exhibition In/Visible featured a number of Arab American and Arab artists including Emily Jacir, John Halaka, Athir Shayota, Helen Zughaib, Rheim Alkadhi, Abdelali Dahrouch, Sumayyah Samaha, Mariam Ghani and Doris Bittar and was curated by Salwa Mikdadi. Construction of the museum cost $15 million. Donors included Chrysler, General Motors, the Rockefeller Foundation, Saudi Arabia and Qatar. The museum is also a part of the Smithsonian Affiliations. The Arab American National Museum's mission is to document, preserve, celebrate, and educate the public on the history, life, culture and contributions of Arab Americans. The museum serves as a resource to enhance knowledge and understanding about Arab Americans and their presence in the United States. MOVE is a first-of-its-kind national gathering that provides a space for artists, activists, scholars, philanthropists, organizations and others from the Arab American community to connect, learn and exchange ideas. MOVE 2017, produced by ACCESS and its three national institutions – the Arab American National Museum, the National Network for Arab American Communities (NNAAC) and the Center for Arab American Philanthropy (CAAP) – will Mobilize, Organize, Vocalize, and Empower attendees as they explore intersectionality in a safe environment and have critical conversations about a wide range of issues impacting Arab Americans. DIWAN: A Forum for the Arts is now a part of MOVE. DIWAN unites Arab American artists, scholars and performers representing myriad academic fields and artistic genres for a weekend dialogue that reinforces the AANM's commitment to providing a place for community members and artists to meet, exchange ideas and exhibit their work. Notable presenters at the 2009 DIWAN conference include writer Najla Said, poet Suheir Hammad, artist Wafaa Bilal, and poet Remi Kanazi. Global Fridays is a periodic music program at the AANM that promotes World Music. Though Global Fridaysis held at the Arab American National Museum the music is a diverse mix from Mexican American roots music to Chinese Classical and Rock. Arab Film Festival is an annual film festival put on by the AANM that showcases a number of Arab and Arab American films over a weekend. Past festivals have celebrated the career of a particular Arab filmmaker or director. The 2008 Arab Film Festival honored the work of Egyptian film director Youssef Chahine and showed his films The Cairo Station and The Destiny. The festival also features short films such as Kemo Sabe the story of Yussef, a six-year-old Arab-American boy who dreams of being the Cowboy instead of the Indian on the playground. The Arab American Book Award was established in 2006 to celebrate and support the research of and the written work of Arab Americans and their culture. The Arab American Book Award encourages the publication and excellence of books that preserve and advance the understanding, knowledge, and resources of the Arab American community by celebrating the thoughts and lives of Arab Americans. The purpose of the Award is to inspire authors, educate readers and foster a respect and understanding of the Arab American culture. Complementing its regular lineup of solo and group exhibitions of art from the Arab world and its American diaspora, the museum holds a permanent collection of paintings, drawings, sculpture, photography, and installation art. Artists represented in this collection include Emily Jacir, Julienne Jabara Johnson, Mary Tuma, Sama Alshaibi, Hani Zurob, Helen Zughaib, John Halaka, Samia Halaby, Kamal Boullata, Doris Bittar, Sumayyah Samaha, Afaf Zurayk, Leila Kubba Kawash, Athir Shayota, Wafer Shayota, and Adnan Charara. ^ a b "Arab American National Museum of Arab American History, Culture & Art". Arabamericanmuseum.org. Retrieved 2009-04-09. ^ Farhat, Maymanah, "IN/VISIBLE Art Exhibition Inaugurates Arab American National Museum", Washington Report on Middle East Affairs, August 2005. ^ Harry Mount. Islam's US faithful are happy to embrace the American dream, Daily Telegraph, July 23, 2005. ^ "Arab American National Museum". Affiliates. Smithsonian Affiliations. 2011. Archived from the original on 2011-09-29. Retrieved 15 Jul 2011. ^ "DIWAN: A Forum for the Arts". Arabamericanmuseum.org. Archived from the original on 23 March 2009. Retrieved 2009-04-09. ^ "Global Thursdays Home Page". Arabamericanmuseum.org. Retrieved 2009-04-09. ^ "Youssef Chahine Tribute Tops the Bill at the Arab American National Museum's 2008 Arab Film Festival". Arab America. 2008-10-22. Retrieved 2018-10-21. ^ "Kemo Sabe". Audience.withoutabox.com. Archived from the original on 2008-08-20. Retrieved 2009-04-09. ^ "Arab American National Museum". Arabamericanmuseum.org. Archived from the original on 3 March 2009. Retrieved 2009-04-09. This page was last edited on 21 October 2018, at 04:28 (UTC).